Alternately explosive and restrained, the aptly titled The Bloom and the Blight is a meditation on past and present - melodic fury matched with the eloquent, confessional lyricism that has made Two Gallants an enduring favorite of both fans and critics. Capturing the sound of a new beginning, The Bloom and the Blight celebrates the band's much anticipated reunion following a multi-year break. It is the work of Two Gallants, fully matured, the band fearlessly exploring new ground in search of a sound that defines a very personal catharsis. Capturing the sound of a new beginning, The Bloom and the Blight celebrates the band's much anticipated reunion following a multi-year break. It is the work of Two Gallants, fully matured, the band fearlessly exploring new ground in search of a sound that defines a very personal catharsis. ?We've both gone through some hard stuff personally, so this album has that element of the cathartic, of a release of tension,? explains Adam Stephens (guitar/vocals), ?We had taken time off, and we did different things, played in different bands. And in doing those things, being apart and redefining ourselves in that way, we were able to come together with a fresh approach.? That approach includes everything from the distorted ferocity of ?Halcyon Days? to the heart-wrenching acoustic ballad, ?Sunday Souvenirs?. Songs like ?Ride Away? boast all the prowling, anthemic strut of classic metal; while tracks like ?Winter's Youth? start sweet and sad, than shatter into huge and heavy choruses. The album's first single, "Broken Eyes," has already become a crowd favorite with its raw, aching harmonies and weeping harmonica. ?Our past albums have been a lot more folk and blues-based, and I tried to move away from that to some extent,? Stephens says of the band's fresh direction, ?I wanted to find a rawness in the music and take us back where we'd come from, from punk rock and grunge in particular, to our childhood, in some ways.? Friends since they were five, the band grew up playing music together, from early teen-age house parties in their hometown of San Francisco, to multiple world tours. Throughout their extensive travels over the past 8 years ? including recent tours through China and South Korea ? 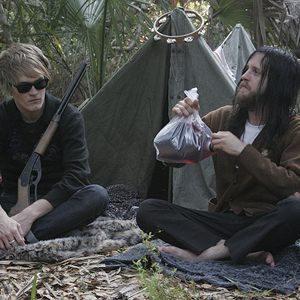 Two Gallants have continued to evolve, both musically and personally. The bands' very first single, "Nothing to You" (from their 2004 debut The Throes), started off a string of cult classics that helped define their signature sound. The success of the sophomore album, What the Toll Tells (2006), delivered a few more singles, including ?Steady Rollin'? and ?Las Cruces Jail?. The wistful ?Seems Like Home to Me? from The Scenery of Farewell EP (2007) and ?Despite What You've Been Told? from 2007's self-titled album, provide the framework of the bands development into The Bloom and the Blight. ?This record is important for us - as a next step,? explains Tyson Vogel (drums/vocals), ?It's a passage into adulthood in a lot of ways. We had a hiatus of a few years, and each of us went through things that we had to go through. This record breaks the silence.? In many ways, The Bloom and the Blight reflects the separate journeys of the duo during these past years apart. We hear Vogel finding his own distinct musical voice on the guitar-driven track he penned for the record, ?Decay?. ?It's about a fissure of self,? he says of the song, ?how things you can't control, can wound your heart.? ?I wasn't able to play guitar or piano for about four months,? he remembers, ?but I started writing songs for the record as soon as I was healthy enough.? ?He's an artist in his own right,? Vogel says of Congleton, ?he put his own emotional investment into the songs. And as a result, he took us to another level.? ?We went on different paths these past years,? explains Vogel, ?but I think we share a common feeling, a commitment to try to transcend what we've gone through?and build something stronger out of it. ?